Converting a lead to a Contact represents a point in the relationship with the (potential) client that puts them in a category beyond the rather impersonal status of ‘lead’, or the point at which the client is made the responsibility of a manager rather than an associate, etc. In many cases, this is when the lead makes a purchase or signs a contract. It’s worth noting that Deals and Companies can be associated with Contacts, but not with Leads. When to convert a lead to a contact is, in essence, a management question – at what point does a person cease to be ‘outside’ and becomes ‘inside’? How to convert a lead to a contact is pretty easy. Push the Convert button. 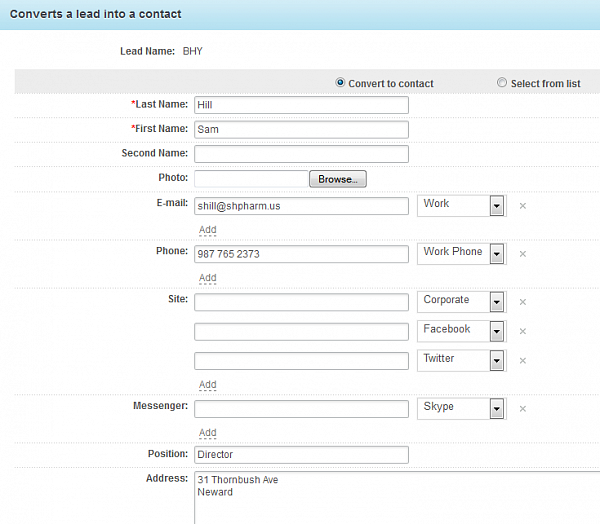 In the conversion form, you have the option to create a new Contact, Company, and/or Deal. 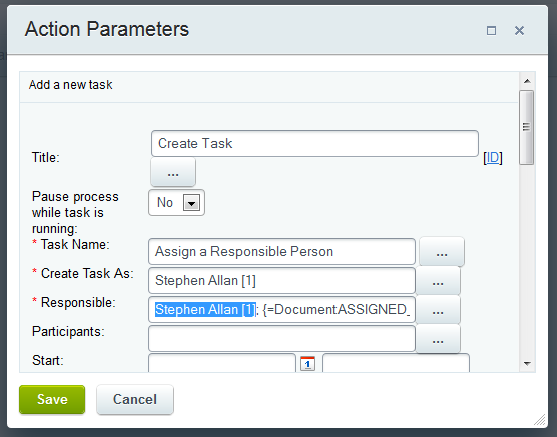 Alternatively, you can “Select from list” to associate this lead with an existing contact or company. 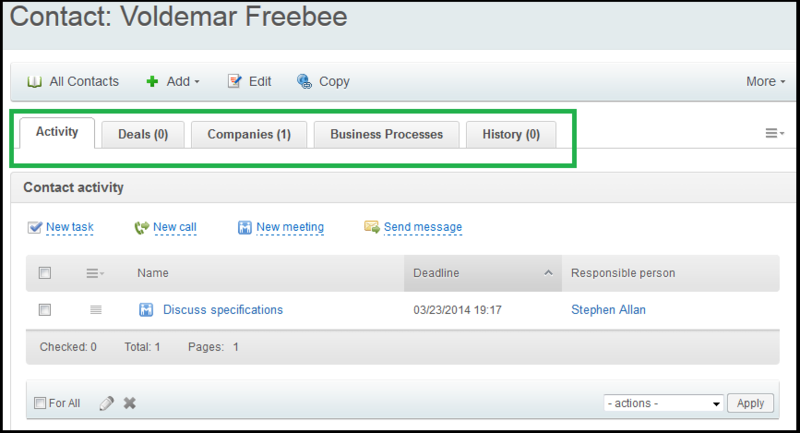 Firstly: Business Processes are designed in the CRM>Settings>Business Processes section. 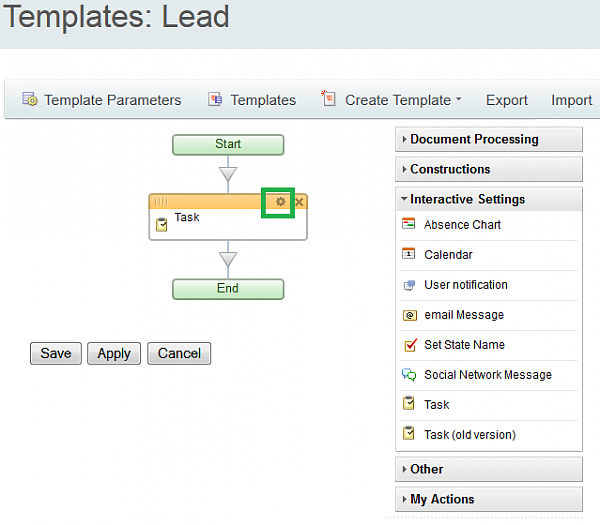 Each CRM object (or Contact, Company, and Deal) has its own set of BPs. Business processes, also called workflow, are a series of actions that are carried out by the system and/or users so that operations are standardized and carried out with monitoring. Common actions in a business process include: approvals, sending notifications, changing some information in a Lead record, or setting a task to be performed relating to the Lead or other object. Creating these workflows takes a little know-how, but NO coding skills. Here’s the simplest of examples, which sets a single task for a person when it is run. When something happens in your CRM – a new lead comes in, a lead or deal changes status, or some information in the lead changes – a business process can be run. 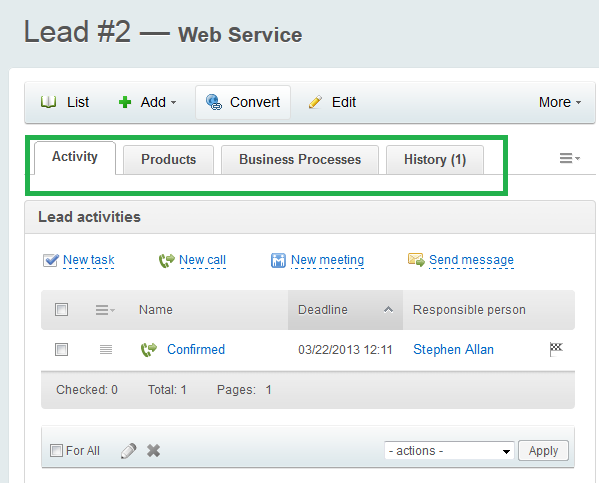 You can also manually launch business processes from the lead list or individual lead detail page. The dialog below appears when clicking the “Template Parameters” button at the top left in the previous picture. To fill out the details of the task that will be created, click on the gear in the top picture (highlighted with the green box). So I have set myself as the “Responsible” person for this task (as well as for the task creator, but that’s more or less a formality). Now, as soon as a lead comes in, I will get a task telling me to assign it to whichever team member is appropriate. 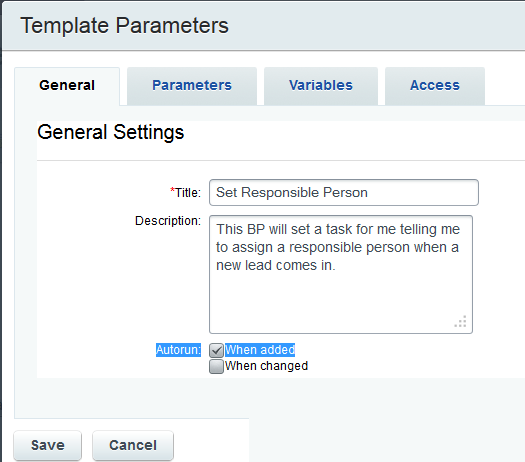 Much, much more can accomplished via BPs – you can auto-assign leads to team members, for example. But hopefully this is a small taste of what they can do for you.